Every day but Sunday, 10 to 6: Picasso and Marie-Thérèse. L’amour Fou at the Gagosian Gallery. This could be the perfect Saturday activity. Ride bikes up the bike paths on the west side of Manhattan. Stop in Chelsea, around 23rd Street. 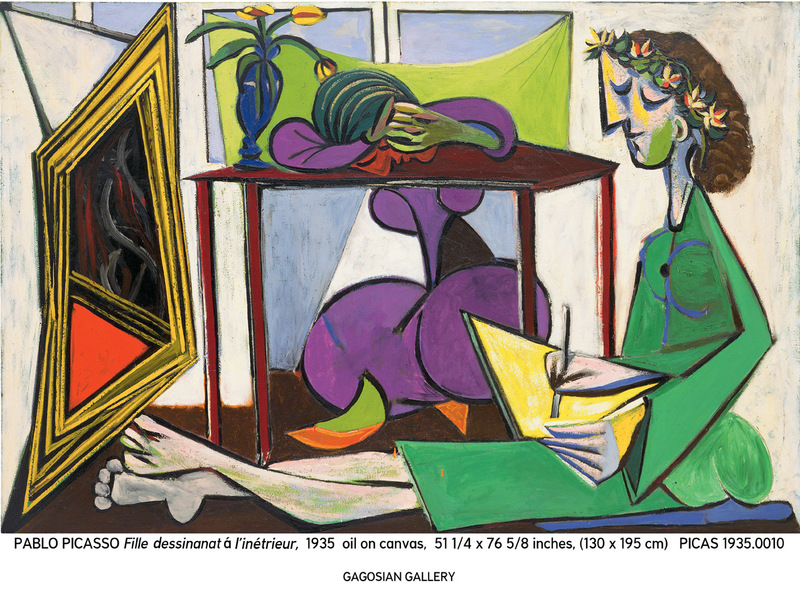 Ride in a couple blocks to the grand Gagosian Gallery, a titan in the Manhattan art scene, now running a gorgeous show of Picasso’s work depicting his longtime lover, Marie-Thérèse, who committed suicide after he died. Lock up the bikes. Grab lunch at Half King Cafe, on 23rd just west of 10th, the home of a stupendous burger and featuring sidewalk tables. After viewing the Picassos, walk the High Line Park, then grab the bikes and head back down to the F train. The Gagosian will run this show through June 25. You have an interesting face. I would like to do your portrait. I have a feeling we will do great things together–Picasso is said to have said, upon running into the blond on the street. 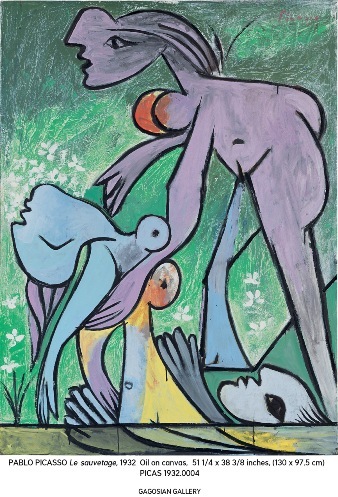 Following the critical and popular success of Picasso: Mosqueterosin New York in 2009 and Picasso: The Mediterranean Years in London in 2010, the Gagosian Gallery presents paintings, drawings, sculptures, and prints inspired by one of Picasso’s models, Marie-Thérèse. The exhibition is curated by the eminent Picasso biographer, John Richardson, together with Marie-Thérèse’s granddaughter, art historian Diana Widmaier Picasso, who is currently preparing a catalogue of Picasso’s sculptures. In 1927, on a street in Paris, Picasso encountered the unassuming girl, just shy of eighteen years old, who would become his lover and one of modern art’s most famous muses. “I am Picasso,” he announced. The name meant nothing to Marie-Thérèse so he took her to a bookshop to show her a monograph of his paintings and asked if he could see her again. Flattered and curious, she agreed, and thus began a secret love affair that would establish Marie-Thérèse as the primary inspiration for Picasso’s most daring aesthetic experiments. 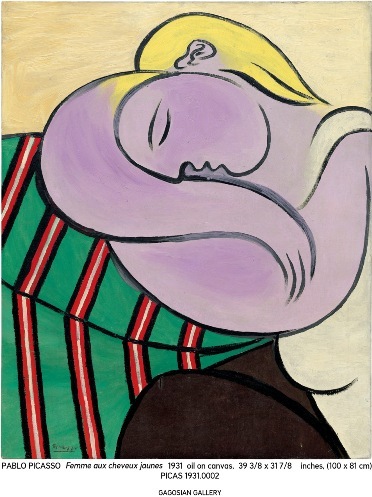 More than any other woman that Picasso desired and painted, Marie-Thérèse, with her statuesque body and strong profile, fueled his imagination with a dream of youth. 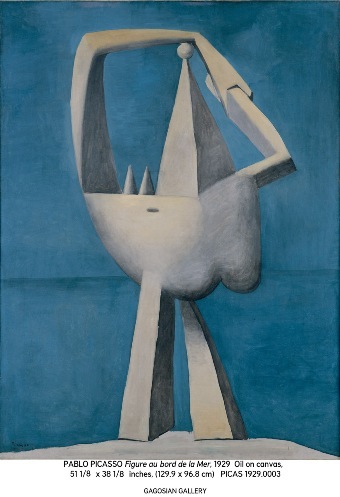 Although her first appearances in his work were veiled references with her initials forming spare linear compositions, such as in the earliest work in the exhibition, Guitare à la main blanche (1927), the arrival of the blond goddess’s likeness in his art announced a new love in his life. In portrayals, Picasso would stretch her robust athletic form to new extremes, metamorphosing her in endlessly inventive ways. She became the catalyst for some of his most exceptional work, from groundbreaking paintings to an inspired return to sculpture in the 1930s, according her an almost mythic stature and earning her immortality as an art historical subject. Yet her true identity remained a secret from even Picasso’s closest friends. 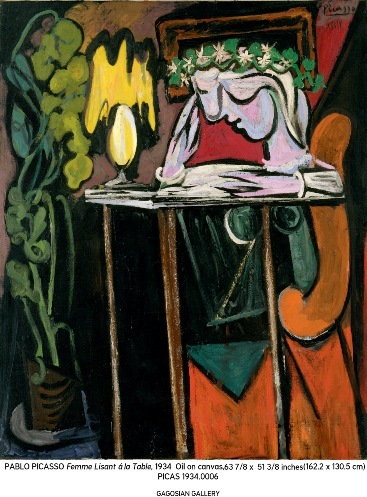 Even after Marie-Thérèse bore their daughter Maya in 1935, Picasso would continue to divide his time between his professional life as the most famous artist in the world, and his secret family life, spending Thursdays and weekends with her and Maya and amassing a trove of love letters and snapshots exchanged while they were apart. Pablo Picasso was born in Málaga, Spain in 1881 and died in France in 1973. Gallery is located on the ground floor and is wheelchair accessible. The gallery does not provide wheelchairs. Please be advised – there are no public restrooms in the gallery. Hours: Mon. to Sat., 10 a.m. to 6 p.m. The Gagosian is one of the great reasons to have a Manhattan apartment nearby. And I love that they are featuring this period of Picasso’s work. It is nice to see someone so influential influenced.